will make this the best-studied lahar ever. Dr. Manville's words describe the success of a unique study of a volcanic rock slide and mud flow, called a lahar. When a volcanic crater fills with rainwater, the walls of the crater sometimes collapse, releasing a catastrophic flood of mud and rock. The word lahar comes from Java in Indonesia, where the frequency of volcanoes and the abundance of rain make these mud flows a common occurrence. Lahars are usually hard to study because their occurrence is unpredictable and their flow is violent. Knowing when and where to place instruments is a tough guess, as the dense, rock-filled lahars often damage or destroy instruments in their path. 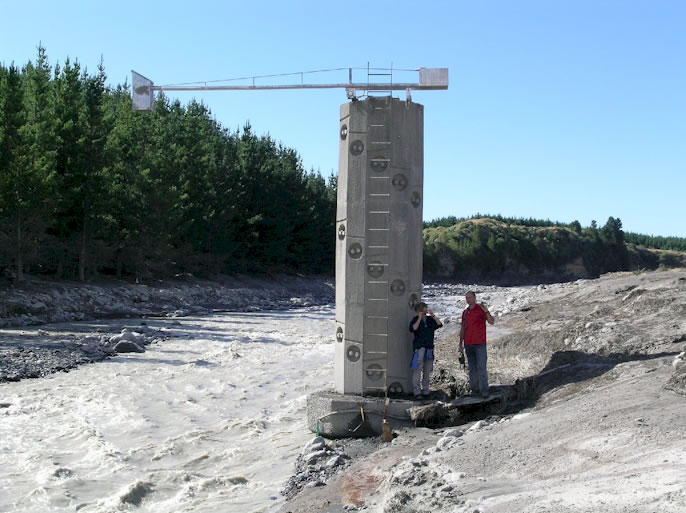 Because of this, Dr. Manville and his team from New Zealand's GNS Science agency and Massey University considered it rare good fortune to be able to set up monitoring equipment in advance of a recent large-scale lahar at Crater Lake on Mount Ruapehu. The volcano was close enough to the study centers that extensive preparations could be made at the site. The path of the expected flow was predictable enough to allow placement of sensors where they could gather the most information without being destroyed. Campbell Scientific gear was a big part of the effort. Our CC640 digital camera connected to a CR1000 datalogger captured the dramatic collapse of the crater wall and the flood of lake waters through the opening. Sensors and CR1000 and CR800 dataloggers were positioned down the path of the lahar to collect data about its level and sediment content. The instruments had to be mounted on hardened towers or canyon walls to survive the tremendous force of the lahar. Dr. Manville said, “The gear worked perfectly, and the weather was just good enough to allow us to see the collapse of the dam and the Crater Lake pouring out through the breach.” Scientists will spend months gathering follow-up data, and years analyzing it all. The intensive study of New Zealand's Ruapehu lahar may enable us to better predict and prepare for these dangerous phenomena.